Bruce Roy, 48, was arrested Sunday night in Augusta. AUGUSTA — Neighbors who offered an Augusta man a plate of food after he’d told them he hadn’t eaten much recently didn’t get the response they might have expected Sunday night. Police say the man rejected a meal from the two neighbors before threatening to shoot them with a loaded shotgun. Bruce M. Roy, 48, was arrested Sunday night at his Eastern Avenue apartment, police said, after they arrived and found him standing on the porch, still armed with the shotgun. In an affidavit filed at the Capital Judicial Center, Augusta police Officer Kyle Sheridan said he ordered Roy to drop the gun, and Roy complied. Sheridan said Roy said he “was standing inside his apartment and could hear the neighbors in the apartment above him making statements about wanting to hurt and kill someone,” and he believed the neighbors were talking about him. The man who is listed as a victim of threatening told police that an hour earlier he and Roy had smoked marijuana together, and that he and a woman who lives in a neighboring apartment brought Roy a plate of food for dinner because Roy said he hadn’t eaten much recently. Roy returned it, apparently uneaten, and said to quit doing it. Then, when the two neighbors were outside smoking a cigarette, Roy allegedly pointed a shotgun at them and threatened them, Sheridan said. Sheridan said the seized shotgun had a shell inside the chamber and two more inside the firearm. Roy was unable to post the $2,000 bail set by a bail commissioner and was taken to the Kennebec County jail that night. In court Monday, Justice Donald Marden told Roy he was being charged with criminal threatening with a dangerous weapon, which carries a penalty of up to five years in prison and $5,000. Stephen Bourget, representing Roy as lawyer of the day, asked for a low cash bail or one that was unsecured but accompanied by a Maine Pretrial Services contract. 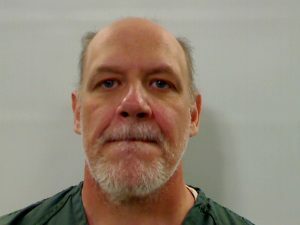 Marden set Roy’s bail at $1,000 cash with a Maine Pretrial Services contract and included conditions prohibiting Roy from possession of firearms and from use or possession of marijuana. A condition of bail prohibits Roy from being at the apartments of the two victims. The judge also asked the district attorney’s office to contact the neighbors about the bail condition. “Tell them they are not to put him in a situation where he cannot avoid contact,” Marden said.